One hundred and forty-five days ago, Helene and I began our adventure around the world. After a short layover in Japan, we headed down to Indonesia, to Denpasar and Ubud on the island of Bali. Relaxed but increasingly annoyed by the overgrown tourist industry of Ubud, we took the slow train across the island of Java, in the most exciting two weeks of our trip to date. 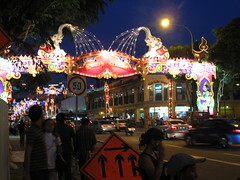 We stopped in the towns and cities of Banyuwangyi, Probolinggo, Surabaya, Yogyakarta, all the way to Jakarta. From Jakarta, we flew to Singapore, where we spent an awesome two weeks with our friends Audran and Joëlle, discovering soup tulang, durian and amazing Indian food. From Singapore, we rode the bus across Malaysia to Melaka, then to Kuala Lumpur, and from there flew to Bangkok, where we happily renewed with the city’s superb street food. We discovered our happy place in a small ocean bay to the south, then ventured forth to Vientiane, Laos, where we lost ourselves in the awesome French food. On the way back, we rediscovered the joy of traveling off the beaten path by exploring the cities of Isaan; specifically, Udon Thani and Nakhon Ratchasima made a strong impression. After all this time, South-East Asia feels like home. In farewell to the region, here’s our very personal roundup of the high and low points of our adventures so far. We found this street stall not too far from the backpacker area by following our noses – no joke! The owner was so friendly and charming, I took to calling her my Indonesian auntie. 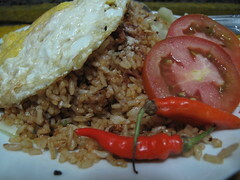 The next evening, her granddaughter cooked our nasi goreng (fried rice) and soto ayam (chicken soup) in a wok over charcoal. The food was so amazing, it beat any fried rice I’ve had before – and I’ve lived three years in China. When my friend Audran said he’d treat us to a fantastic Indian meal, he wasn’t kidding – Yantra’s menu was so exquisite, it makes my mouth water just thinking about it again! Yantra marked one of the first moments in our trip where we just knew we had to go to India next. Thanks again, Audran! 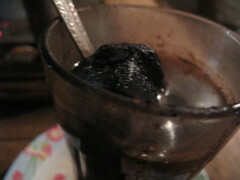 What happens when you take a boiling glass of sweet Javanese coffee, then dunk in a piece of glowing coal? Coffee heaven! We had to look hard to find this one, as it’s only available north of the train station after 6 PM, from a line of street stalls along the sidewalk. The caffeine kept me up all night – it was totally worth it. After a string of amazing food in Denpasar, Bali, it came as quite a shock when we went out for the free breakfast of our local hotel in Banyuwangyi, on the Javanese side. The soto ayam (chicken soup) was barely recognizable, and filled us with sadness. Worst yet was the coffee – in an island known for its coffee beans, it’s shocking to find a cup of java that tastes like the inside of an intestine – no, really, it did. Runner-up: Pad thai on the street in the Khaosan Road area of Bangkok, Thailand. I’ve had a better pad thai in a mall in Canada, and that says a lot. 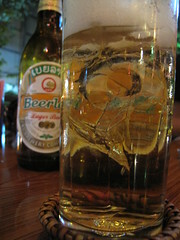 More than just a beer, Laos’ Beerlao is a matter of national pride. You see its charmingly antiquated logo everywhere in Vientiane, making the beer near-ubiquitous in the Lao capital. It’s best enjoyed with ice, Lao-style, cooling down on a terrace. An amazing city, super friendly and helpful staff, a pool(!! ), a balcony… We could have moved into that room on the third floor of Bladok Losmen. We spent all our evenings sitting on the balcony gazing at the city and listening to the evening call to prayer (and then downing a Bintang or two), and even indulged in the fancy but entirely satisfying restaurant downstairs. At $15 USD a night, this was the absolute best value we found. I’ve never run away from a guesthouse after dark – until that night when one of us stepped on a fat cockroach in the dark of our room. Coupled with the crappy shared toilets and the flimsy bed that complained all night at my weight, we just couldn’t face another night there. In Sama Sama’s defense, though, the guy working there was an absolute gentleman about the entire thing. The sound of the ocean usually woke me up in the morning, and we spent our days strolling along the ocean front. We loved the place so much, as a matter of fact, that when I blogged about it, I didn’t dare reveal the name lest some Lonely Planet writer stumbled upon it and ‘discovered’ it. I’m still gonna keep it to myself, but feel free to ask me by email! You get used to the way Bangkok taxi drivers hustle in traffic. Then one day you climb aboard a cab with a driver who appears to be high-strung on amphetamines – allegedly, a common problem with taxis in Bangkok given how many hours they have to work in a day to make ends meet. Our driver proceeded to drive like a madman, and when he bumped a couple riding a motorcycle to the ground, he just sped away as Helene and I yelled our heads off at him. We opened the car doors to threaten damage to his cab if he didn’t stop, but that didn’t seem to scare him as much as the prospect of facing the cops. When the traffic in a side-alley forced him to stop, we took the cue – and jumped out of the cab. “Welcome to Probolinggo!” grinned a young man, shaking my hand. This type of exhuberant display of friendliness was our first real contact with Java – and we fell in love with it. People asked us to pose for pictures with them, and a group of kids yelled at us enthusiastically from the other side of the busy boulevard. Helene ended up spending a long, merry hour talking to the girls, who gave her a rock star ovation when they saw her walk by the next day. We love Probolinggo! Kara and Damien, two Americans on a year trip, wrote me one day to discover the secret of our Happy Place. They asked nicely, so I relented. We hooked up for a street-side meal and a few drinks, and became fast friends. We gave them our Rough Guide to Thailand, and we inherited a cozy wool sweater given to them by friends in Jordan, an Indian SIM card, and plenty of advice on India and the Middle-East. Here’s to our next encounter on the road! We call him “Papa Bill”. He latched unto us in Probolinggo, and just wouldn’t let go. Loud, disrespectful, narcissic and scatterbrained, he walked around with his younger Thai wife in tow, and through sheer inspired negligence ran into trouble faster than I could blink. When we boarded the train in Probolinggo, his presence and his numerous insults to the Indonesian people – spoken at loudspeaker volume – chilled the previously friendly atmosphere in seconds. He then proceeded to take pictures of workers outside the train, yelling “Yes! Yes! Yes!” to quell their protests. When the train came into the station in Surabaya, we didn’t think twice – we ran. It’s been in the cards a long time – we’re headed to India! Whether it was the vibrant lights of Deepavali in Singapore, or the street-side delights of a South Indian restaurant in Melaka, we’ve been craving a visit to the Indian subcontinent since the very first days of our trip. On January 29 2010, we’re boarding a flight to Kolkata, in West Bengal. A new chapter begins for the Backpack Foodie! Wow, y’all have really trekked all across Southeast Asia – I can’t believe you have spent over five months. We just got to Thailand two weeks ago and love it and I would really like to know the name of your Happy Place. I’ll shoot you an email to find out because our plan is to make our way south to Cambodia, then probably back over to the Thai beaches, and then north to Laos . . . or something along those lines. Have fun in India! We’ll be there in mid-March for a bit, so if you’re still in the country, maybe we can catch up. I just want to say that Kara and I are deeply honored to have been named Coolest Fellow Travelers. We very much enjoyed hanging out with you and Helene in Bangkok, and have had a great time with your Thailand recommendations. (Btw – the pad thai and green papaya salad with crab = amazing). Hopefully our paths with cross again in the future. Until then, many happy namastes for your travels in India. Remember to sharpen your elbows! You are making me hungry and jealous!!! I am longing for the day that I can go to SEA and eat the scrumptious delights. Hopefully in a few months I’ll be there too! Have fun in India. Great post, I was in South East Asia two years ago and my boyfriend and I still reminisce about the food there. 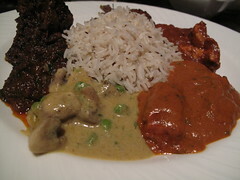 Looking forward to what you’ll eat in India as I plan to make my way there after South America. Very cool blog! 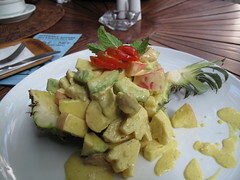 We just met Damian and Kara at a cooking class in Chiang Mai and after looking at their blog I stumbled across yours. I’ll be following your progress in India as that’s where we’re headed next. Too bad you didn’t stay at the Old Town Family Guest House in Melaka. We stayed there on a recommendation of a traveler we met and loved it. Nice place run by nice people. Also, we went to the hugely popular Capitol Satay restaurant in Melaka and had a great meal. Cool hearing from you! 🙂 Really neat that you met Damien and Kara. It feels like we’ve passed each other, as they were just coming into Thailand, and we were leaving for the subcontinent. I didn’t go to Capitol Satay!! Darn, I meant to do it! I noticed it when I saw it was always jam-packed with locals… Then I noticed it was in the guidebooks, too. Ah well, something else to look forward to on the next pass! 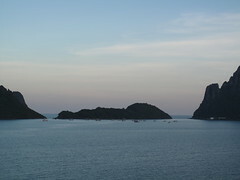 My friend is traveling and looking for quiet friendly lovely beach in southern Thailand. You mentioned you might reveal it to an individual could you suggest your find? There’s a beach near Prachuap, but you need to take a tuktuk to reach it.